Are You Bold Like Peter, or a Fool Like Peter? Are you afraid of looking like a fool for being bold and taking action? I am here to say, count on it – you will be considered a fool. Yes, I said you WILL. The classic example of this is Peter. The story is in Matthew 14. Peter steps out of the boat and walks on the water with Jesus. 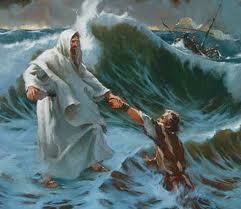 Peter started to sink and Jesus pulled him up asking him why he had such little faith. But what about the disciples who were still in the boat? We never talk about them. What about their faith? What about their failure? Think about it. No one but Peter ever has walked on water with Christ – no one. Only one person has shown the faith and boldness to act – all while the others sat in the boat and watched. Peter’s story is critical to those looking for work, starting companies, or doing pretty much anything. Yet, way too often we take the timid approach. We get caught up in the fear of what might happen and spend endless amounts of time and energy on planning and second guessing ourselves. The difference between success and floundering is often one simple thing – action. So to you, and to me, I say … get out of the boat! Be bold! In the last year, what has stopped you from getting out of the boat? What will you do different this year?